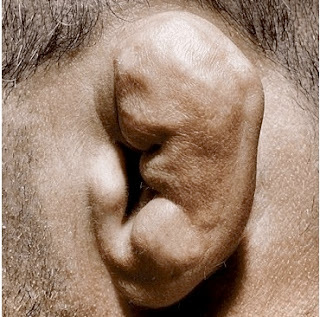 Study Medical Photos: Cauliflower Ear. Medical students are examining a patient in the medical ward admitted with the diagnosis of pneumonia. While doing a general physical examination a deformity is observed in his ear. The patient mentions that he got it after a trauma few years ago. This deformity is known as Cauliflower Ear. Cauliflower Ear: It refers to a deformity of the ear that is caused by a blunt trauma or an injury to the ear. Initially there is bruising and swelling due to subperichondral hematoma. If the swelling is not drained or repeted trauma occurs, this leads to a deformity known as Cauliflower ear. It is often seen in boxers, wrestlers and rugby players. Causes: Most commonly cauliflower ear is related to sports injuries but it can be caused by any blunt trauma to the ear. It can even result from an infection in the ear lobe. Can be a complication of high ear piercings through the cartilage. Symptoms: The initial symptoms are those of the trauma and injury : pain, swelling and bruising. Treatment: Early identification and prompt treatment can prevent cauliflower ear. It is done by incision and draining the accumulated blood. . Later plastic and cosmetic surgery procedures may help.